Do you get so anxious during a test that it is hard to remember the answers? Are you worrying all the time about exams and having trouble sleeping? Are you experiencing muscle tension, headaches, or stomachaches? Are you tired or irritable all the time? Do you ever get so anxious that your heart races, your chest hurts, and it is hard to breathe? As a psychiatrist working with college students for over twenty years, I have witnessed the personal toll of record high levels of anxiety on college campuses today. In the last year, one out of five college students have been diagnosed with or treated for an anxiety disorder and almost two of three at some point felt overwhelming anxiety. Students can get into a vicious cycle where academic stress can lead to anxiety, which can cause poor academic performance, leading to more academic stress and anxiety. The good news is that many colleges have recognized the need to address this problem and have offered resources to help. Encourage your child to visit the campus counseling center. Mindfulness meditation and cognitive behavioral therapy are very effective treatments for anxiety. Many campuses provide individual and group therapy using these modalities. Promote a healthy lifestyle. Exercise, regular meals, minimal or no caffeine, abstaining from drugs, avoidance of binge drinking, and regular sleep can all reduce anxiety. If the anxiety does not respond to therapy or lifestyle changes, your child may consider a visit to a psychiatrist. About 60 percent of campuses have on site psychiatrists, and those that do not can refer your student to a community psychiatrist. A psychiatrist can diagnose common anxiety disorders like social anxiety disorder (performance anxiety or shyness), generalized anxiety disorder (pervasive anxiety) and panic disorder (frequent attacks of extreme anxiety). Psychiatrists can prescribe medications such as sertraline, escitalopram, or venlafaxine, which can be very effective for some students in helping to treat these disorders. Recommend your child visit the campus disability resource center. If your child is diagnosed with an anxiety disorder by a counselor or psychiatrist, the disability resource center might provide academic accommodations such as taking exams in a quiet room rather than a large lecture hall, academic coaching, and extra time on exams. Suggest your child sign up for a class on stress management. Many schools are now offering these classes for credit, in which your child can acquire life-long skills to promote wellness. As parents, watching your child deal with anxiety can feel disheartening, but know that support is available. I’ve seen many students overcome extreme levels of anxiety and go on to lead happy, healthy, and successful lives. Hyperfocusing on academics only increases anxiety, so encourage your child to go beyond the classroom and library to find enriching experiences on campus: tutor a child in science at a local elementary school; participate in a softball game to raise money for a meaningful cause; row intramural crew. Enjoy the journey of self-discovery and social connection that college can provide, while finding ways to manage anxiety for now and into the future. Marcia Morris, M.D. is a psychiatrist who has provided care to university students for over twenty years. 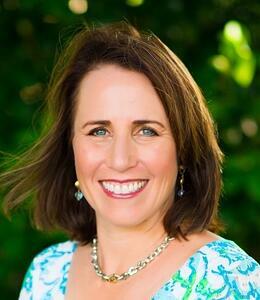 She is the author of The Campus Cure: A Parent’s Guide to Mental Health and Wellness for College Students. She writes a parenting blog for Psychology Today on College Wellness. Dr. Morris is an Associate Professor at the University of Florida College of Medicine and Associate Program Director for Student Health Psychiatry. A Fellow of the American Psychiatric Association, Dr. Morris attended Harvard College, Yale School of Medicine, and the New York Hospital Cornell Medical Center psychiatry residency program. Kevin is an intellectually gifted student whose anxiety prevented him from completing work and earning credit for classes. 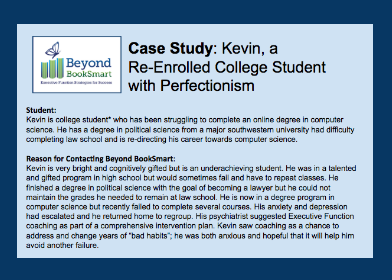 Download our case study to find out how coaching helped Kevin be more productive.